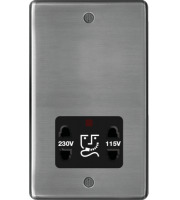 If you want quality low profile metal shaver sockets that make shaving in the bathroom a lot less complicated and much more organised then check out our range of electric shaver units. 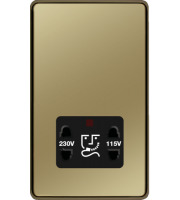 Direct Trade Supplies now stock a variety of shaver socket switches made by some of the best electrical brand names in the business including the likes of Hager. 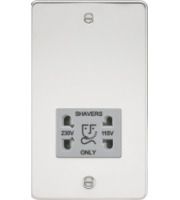 All of our low profile shaver sockets are clearly marked, easy to install and compatible for most electric shavers. 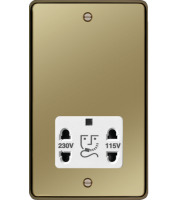 Each low profile metal plate accessory socket is strong and stylish, easily adaptable and built to stand the test of time. 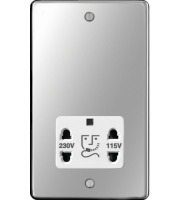 Installing a shaver socket into the bathroom will provide you with that added bit of convenience for when you next want to shave. Simply connect the shaver and you’re away! Shaving can be a bit of a chore, and that’s why so many people (mainly men) go rugged for so long, but if you knew that you could achieve the perfect fuss-free shave within moments then attitudes may just change. 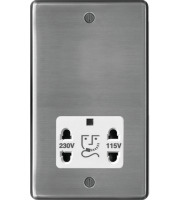 These metal electrical shaving sockets will save you time and energy, becoming a great asset for when you next need to sharpen up your looks! 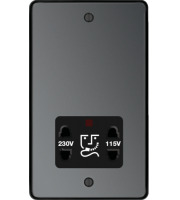 Direct Trade Supplies can now provide you with a selection of shaver units made by Hager, a luxury brand within the electrical switches and sockets industry.. All of their products will supply you with greater benefits whenever you want to shave, what’s more these units are firmly fitted to the wall and fixed to one location meaning you’ll never find it hard to seek out the unit in your time of need. 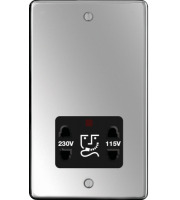 Whether you're a homeowner who is fed up of unsatisfactory shaves, you want to get more organised or you are an electrical contractor or interior designer looking to supply your client with a more convenient approach to shaving, it really doesn't matter because a shaver socket can appeal to everyone! All of our electrical products have been safety checked and tested for performance levels, this ensures that whenever you buy one of our goods you’ll be guaranteed a secure and working product. So why not rave about your next shave using one of our quality metal shaving sockets.